Balloons over Waikato are delighted to introduce our first special shape confirmed for 2017, brought to you by McDonald’s Hamilton. 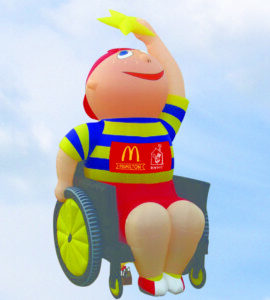 Built in Spain 2012, Robbie for Ronald McDonald House is 40 meters tall and weighs 454 kilograms and was inspired by a real life boy named Robbie Medina. Local McDonald’s franchisee, Debi Rush says: “We chose Robbie because he reflects McDonald’s national charity, Ronald McDonald House, who help Kiwi families stay close to their children throughout their medical journeys. The Newport family from Taupiri stayed at Ronald McDonald House for over ten months after three-year-old Wiremu was diagnosed Leukaemia. “Ronald McDonald House provided us with warmth, comfort, security and love. I cannot imagine how we would have coped otherwise,” says mum Tina Newport. US pilot Kim Lynch, says: “It’s a privilege to bring Robbie to New Zealand. We’re grateful for the support of McDonald’s Hamilton and are excited to have Ronald McDonald join us for the maiden flight”. Make sure you don’t miss Robbie for Ronald McDonald House at Balloons over Waikato, Wednesday 22nd – Sunday 26th March 2017.